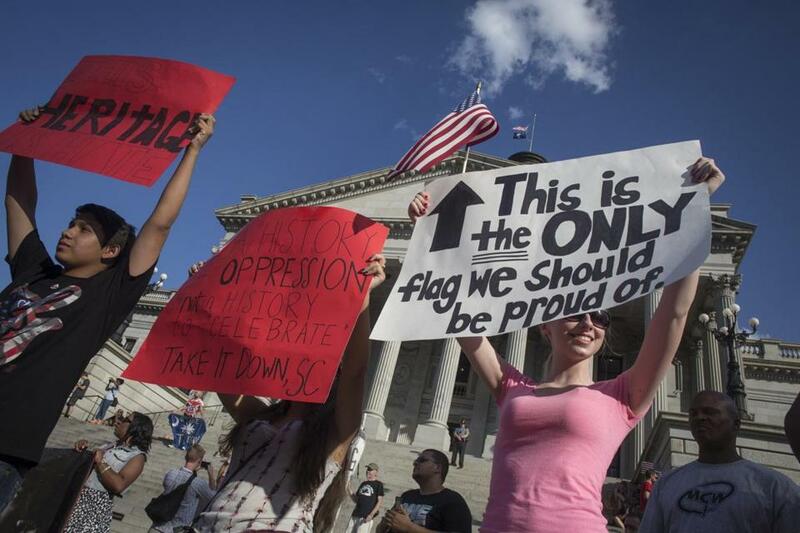 People gathered at a rally calling for the Confederate flag to be taken down at the South Carolina Statehouse. 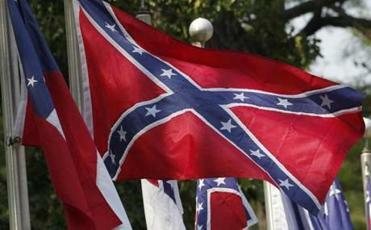 A South Carolina senator has proposed a bill that would move the Confederate flag from the Statehouse to a relic room in a museum. Senator Vincent Sheheen, a Democrat,introduced the bill Tuesday. It would move the flag from a 30-foot pole in front of the Statehouse to the Confederate Relic Room and Military Museum. Sheheen’s introduction came after lawmakers overwhelmingly agreed to take the first step to debating the flag, which will likely occur later this summer. Only one South Carolina senator stood up to speak against extending a special legislative session to debate removing the Confederate flag from Statehouse grounds. Senator Danny Verdin’s voice broke as he remembered his friend, slain state Senator Clementa Pinckney, who was the pastor of Emmanuel African Methodist Episcopal church at the time of the rampage. Facing pressure from angry consumers, Amazon on Tuesday became the latest big retailer to remove Confederate flag merchandise from its offerings. Another senator who is expected to vote against moving the flag also spoke briefly, but didn’t mention his opposition. Senator Lee Bright, a Republican, said he was taken aback by the forgiveness offered by several families of the victims at the bond hearing for the suspect. The Senate approved extending the session by a voice vote. The House earlier approved it 103-10. The flag will likely be debated in a couple of weeks. The flags surround an 88-foot tall Alabama Confederate Monument that was erected in 1898. The Alabama Legislature is expected to meet later this summer for a special session on the budget. US Senator Tim Scott, Republican of South Carolina, thanked the senators who have reached out to him after the killings in Charleston last week. Emerging from the weekly Republican luncheon Tuesday, Scott also praised the family members of the nine victims who spoke of forgiveness during Friday’s court session with Dylann Storm Roof, who faces murder charges in the massacre. Scott said: ‘‘Perhaps if there is a moment for us to take a step back from the political process and recognize and appreciate true righteousness,’’ it is now when we see the families of the victims. Tim Scott appeared with Governor Nikki Haley of South Carolina on Monday when she announced that she believes it’s time for the Confederate flag flying on the Statehouse grounds to come down. Lucas, a Republican, made the comments Tuesday just before legislators approved a measure that will allow them to debate the removal of the Confederate flag during their special session. Meanwhile, vandals have again defaced the statue of Jefferson Davis at the University of Texas as another push is underway to remove it from the Austin campus. Campus security spokeswoman Cindy Posey says ‘‘Black lives matter’’ was scrawled early Tuesday on the base of the statue to the president of the Confederacy, and also on those for Confederate Gens. Robert E. Lee and Albert Johnston. ‘‘Bump all the chumps’’ also was sprayed below the Davis statue. This is at least the fourth time over the years that Davis’ statue has been defaced. The latest comes in the wake of a massacre at a black church in Charleston, S.C. In the wake of that attack, two monuments in the city were vandalized. Meanwhile, in Texas, an online petition recently was launched to have the Davis statue removed from campus. But Davis’ great-great grandson, Bertram Hayes-Davis, says his ancestor was a statesman with a broad list of accomplishments who’s being unfairly demonized. The South Carolina House earlier approved a measure that allows them to consider removing the Confederate flag from the Statehouse grounds. The lawmakers are in a special session Tuesday to pass a state budget, but they took the extraordinary step to allow the flag debate after nine black church members were killed last week in Charleston. Legislators will pass a state budget and when they return to consider Haley’s budget vetoes, they will take up the flag issue. That could be in a couple of weeks. The House held a moment of silence for Pinckney, the state senator who was killed in the attack. Adcox reported from Columbia. Steve Peoples in Washington, D.C., contributed to this report.